Caesar: Tossed in Caesar dressing, diced onions, black olives, tomatoes & Bleu cheese crumbles, & parmesan. Grilled: mixed cheese, tomatoes, olives & egg. Topped with eggs, ham, turkey, black olives, tomatoes, mixed cheese, onions, mushrooms & your choice of dressing. Kalamata olives, celery, diced onions, capers, pepperoncini, feta cheese, lemon & our house-made greek vinaigrette. 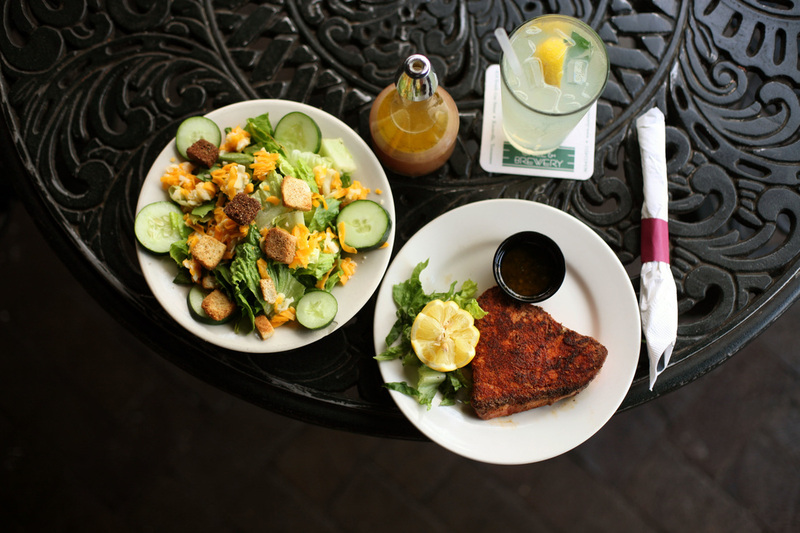 Made at your tableside during your visit or in a box if ordered to-go. Croutons & parmesan tossed in Caesar. Croutons, tomatoes, mixed cheese & cucumbers. Pizza crust covered with marinara and topped with mozzarella, cheddar, jack, smoked Gouda and Parmesan. Baked to perfection and delivered to you for final inspection. We use and Alfredo sauce instead of marinara. Not just any Alfredo, ours! Topped with Italian seasoning, spinach, sliced tomatoes & mozzarella cheese. as our base, sprinkle with Cajun sesoning, add Cajun chicken, spinach mozzarella & Itlatian Seasoning. We start with pizza crust & layer it with marinara & mozzarella cheese. From here, be a visionary, be a dreamer, be an architect of deliciousness. Add the toppings you desire. We take it up a notch with this one. So, consider yourself warned. We use Sriracha Ranch as our base & then add sliced jalapeños, diced chicken, & top it with mozzarella & fresh chopped cilantro. We use our house made Stout BBQ as the base & layer with grilled chicken, red onions & mozzarella cheese. Covered in marinara, spinach, mushrooms, diced red onions, chopped ham, bacon, pepperoni & topped with mozzarella.